How many online commitments do you have? I went through a bout where I was subscribing or "GFC'ing" (Google Friend Connect) to a bunch of blogs! I was trying to win some cloth diapers. Not to be a downer, but I didn't win anything. I recently discovered Google Reader (I know, I know, you already use it). I really like it so far. It let me see that I had a lot of posts I hadn't read. How many is a lot? Anyway, by the time I stopped working on my subscriptions last night, I only had 21 posts left to read (or mark read). I still have to re-do some of my unsubscribing after trying to do it through Google Reader instead of Blogger Reader, but there you have it. How many things are you reading more often than you really care to read them? Or are cluttering up your screen, even if you just have to click them to make them go away? Take a little time one day to thin them down and you can save yourself little bits of time every day. I've also been paring down some of my social network "Friends Lists." Others have just been "hidden." If you have, for instance, someone you feel you can't remove because they work with you, are a distant (or not-so-distant) relative or whatever, but you don't care to read all the junk they post, you can click the little "X" to the right and hide everything by them. I've done this with all the bands I've "Liked" on Facebook as well. I spend enough time on Facebook as it is without having to scroll past news of concerts in far away places. Where else can we digitally minimize to allow us more time? I've seen some moms go so far as to delete their blogs and disappear! I don't want to do that, this blog is my hobby. I love writing here and elsewhere. And as much as I stay home, I greatly appreciate my online social network and the support they (you!) have provided to me! Great topic. It really is hard to manage blog reading and all of the social networking sites! 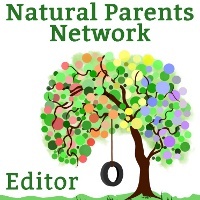 Thank goodness for the Natural Parents Network volunteer RSS feed! I'm always happy to hit that up when I'm nursing in the middle of the night. I also run through my blogroll to make sure I'm getting to all of my favorite blogs a couple of times per week. I use Google Reader and although it really helps me keep up with the blogs I love, it makes it so much harder to comment. I rarely click through to make comments, especially because I read almost 100% of the time on my phone.